It's getting there! And today, I have finished the second lace panel, which just leaves the lace collar, the sewing up and the picking up and knitting around the armholes and the bottom . It's a pity I go on holiday tomorrow. It is pretty sheer, but I'm not really sure what I expected. I think if I'd read the instructions properly before starting and realised that the lace panel is on a needle a whole mm bigger I might have rethought my needle/yarn combo choice, and maybe rejigged it for a finer gauge. As I have been knitting it, I have become concerned that I will never actually wear it. So, I think I will be taking it all on holiday with me, sewing up on the train to the airport, and finishing it on the beach, to wear on the beach. Hopefully. It will mean winding off some of the linen to take with me, because I am NOT lugging those cones on the plane, but it will be a small price to pay. This is definitely a garment for holidays, and if I have to wait another year to wear it we all know it will sit in the UFO pile until then. I had lots of egg yolks in the freezer after all that meringue buttercream at the start of July, so today I decided I would have at them and make some chocolate cardamom chocolate custardy things. 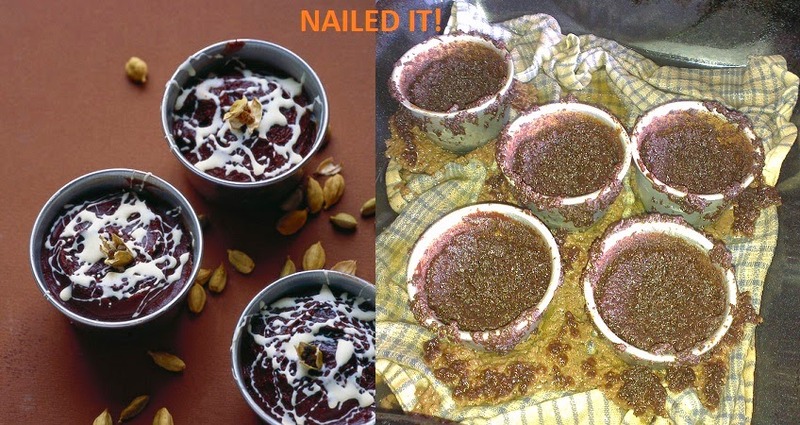 I used this recipe here and I was feeling quite positive about them until the moment when I took the lid off the baking tray to have a peek during cooking. Caption inspired by a post similar to this - they make me cry with laughter. So, I am trying to figure out where I went wrong. Firstly, they only had double cream so I used that instead of whipping. Secondly, I infused the cream overnight because I couldn't be bothered to strain it before I went to bed. Thirdly, I put it in a much hotter oven for the first 5ish minutes until I looked up the temp and then turned it down. Finally, let's not forget the previously-forzen egg yolks, which might have had something to do with it. In the end I beat what was left in the cups and chilled it and it tastes OK though not the velvety-textured loveliness I was expecting - more like ganache. But hey, waste not want not. I will conquer the recipe some other time...maybe. I loved the Oud tank when I got my spring edition of Knitscene, but I couldn't work out why anybody would knit a summery top in worsted wool. Well, when I say "anybody", I mean "I" really. 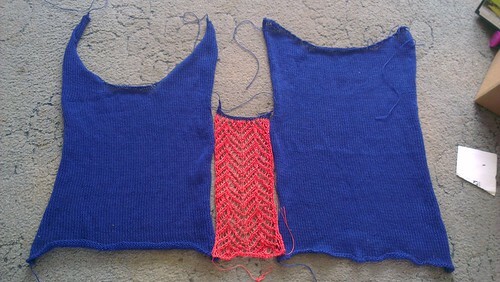 So, I am knitting it in the Texere C4 linen I got at Wonderwool this year; blue for the body of the top and coral for the side panels and the neckline. I'm knitting it on 3.75mm needles so the gauge is much looser than it was on the pink star top, which was done on 3.25mm needles; in fact, it may be so loose as to be a little sheer, but, what the hell? It's a summer holiday top. 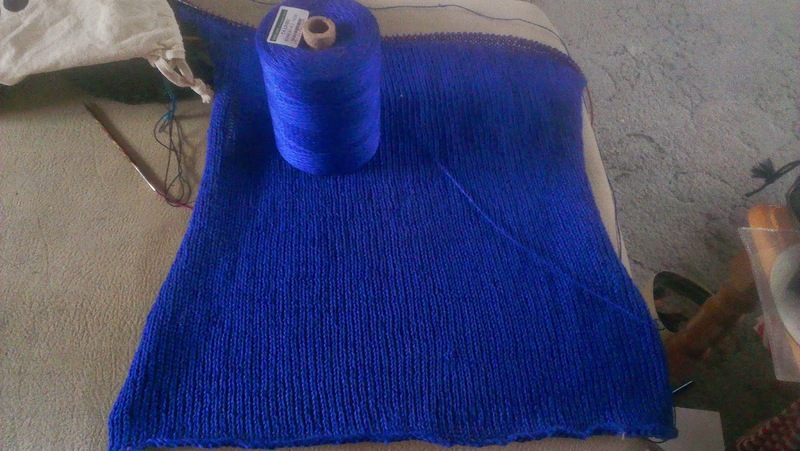 I'm also knitting it in a bigger size than I would normally choose so with positive ease, hopefully it will not reveal enough to get me into trouble. I changed it a little to add some waist shaping; I started knitting the biggest size, then did my decreases and increased to the biggest-but-one size to account for my hips. Since then it's been going quite quick; I was bemoaning, at Knatterers, the pieces technique because I know I'm going to have to knit a replica piece as soon as I bind off. But at least the front will be shorter than the back. I'd like to have it finished by the time I go on holiday in three weeks, which should be doable now that marking is basically, finally finished. Incidentally, every time I see the word oud now it reminds me of that farcical episode of the Apprentice last year when they were shopping in Dubai and had to buy an oud, the musical instrument, but instead bought oud, the personal grooming product. I could totally have done better than all of them; I'd have bought a linen vest top. Stew the gooseberries with the lemon juice until broken up. Press through a sieve into a heatproof bowl; let it cool until it is in a state in which it will not cook the egg. Add the cubed butter, the sugar and the beaten egg. Place over a saucepan of simmering water and cook, stirring regularly, until the curd is really thick - it takes ages, this one. Mine never did get that thick but that's probably because I misread the recipe and only added 50g of butter. Pot in clean jars. Eat with everything. This made enough to thickly coat the top and sides of a 10 inch double decker cake filled with gooseberry curd. Heat the egg whites with the sugar over a saucepan of simmering water until the sugar has dissolved and the egg whites are hot. Stir regularly to avoid any awkward sweetened scrambled egg whites incidents. Other people (that website has a very excellent explanation of the whole process, by the way) suggest heating to a temperature on a thermometer but I don't bother, I just wait until the egg whites are hot to the touch and steaming a little. It goes without saying, I'm sure, that the bowl should not touch the water. If you're lucky enough to have a heatproof bowl for your mixer, do it in this; otherwise, transfer the mixture to the bowl of your mixer*. Use the whisk attachment. Put it on high speed and pop off to do something else for a while (I made another cake). You want a situation where the meringue is, quite frankly, bullet proof and the bowl is cool to the touch. By the time I stopped beating mine, I removed the bowl and whisk so I could finish off the other cake, and when I put the whisk down in the bowl, it barely dented the meringue underneath. That stuff was FIRM. Keep the mixer going, on a slightly lower speed; add the butter a cube at a time. I think I cut mine into nine cubes. I actually cut up a whole 250g block of butter in 12 cubes, but after I'd added half, I stopped and tasted after every addition and then just stopped when it tasted perfect. I keep having batches "go over" on me and get to the point where they sort of taste greasy, so I stopped as soon as it tasted really good. Add the elderflower syrup to taste and keep beating until it is glossy and lovely. This may take more or less time, depending on (I think) how warm your butter is, probably its water content, maybe how high the tide is, etc. 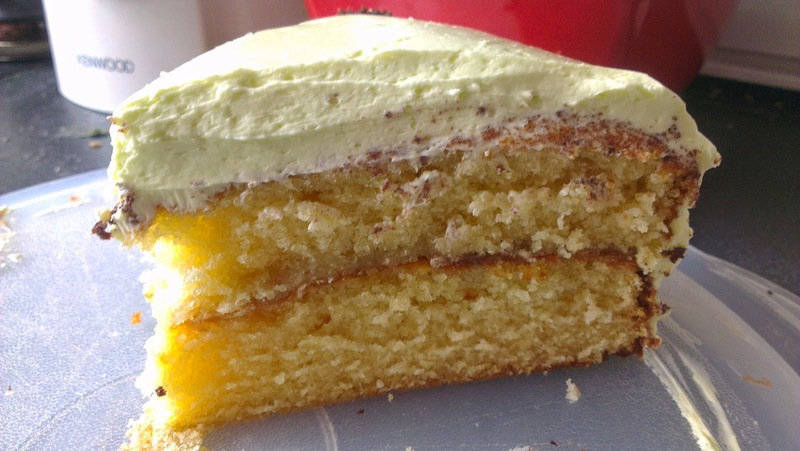 I also added a bit of green food colouring to mine because that's what I do with elderflower icing. It went down like a house on fire, but I think it might be my best cake so I am not surprised. I had to rescue this piece for a picture. * If you don't have a stand mixer, try normal buttercream instead - don't be a hero. I tried it with a hand-held whisk; this was the main reason I finally bit the bullet and bought the Kenwood.